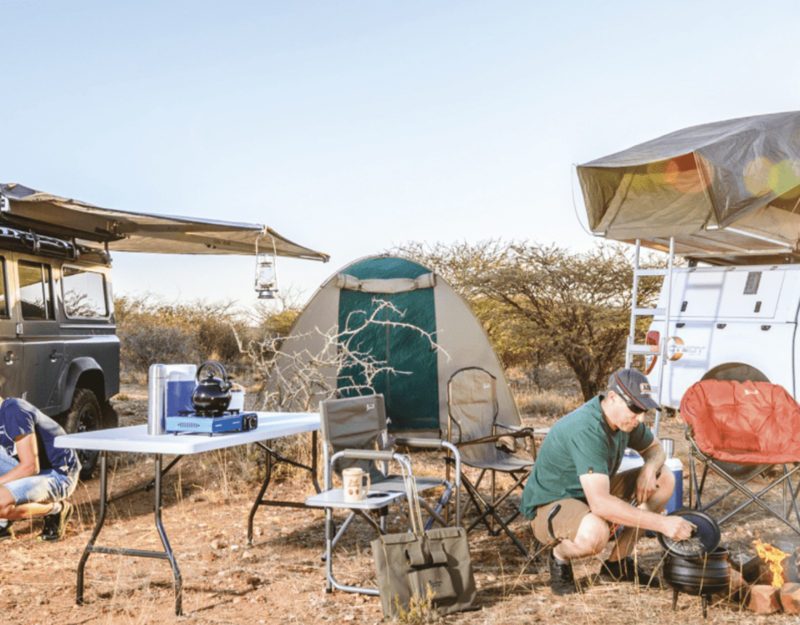 Luxury on the Open Road: Camper-living for the ultimate Namibian self-drive adventure! We set off on our trip on a crisp winter morning. The sun edging over the Auas Mountains that surround the country’s capital. Our first destination: Namibia’s most visited and most highly acclaimed national park, situated in the central north. Etosha lay ahead like a beacon. With a quick pit stop to stock up on some supplies along the way, we were travelling in style. The Hilux bakkie may have been one of many such vehicles on the road but ours was special. We had a few key enhancements, you see… On the back of the Supercab we carried with us our home for the week. Not unlike a snail, our comfortable accommodation was perfectly and snuggly assembled. Making the most of the space and permissible dimensions, the Hertz 4×4 camper came fully equipped for an utterly luxurious camping trip – with everything we might need, wish for or even dream of. Being salted campers we are used to a far less lavish setup. What a treat it was to be able to set up your whole camp in less than five minutes! A click of a clasp, a table quickly pulled out and chairs popped open, a slight push to the tent’s top, the awning pulled open and secured… and there we were. Done and dusted! Reaching into one of the two built-in solar fridges we pulled out two beers and said cheers to a job well (and very easily) done. We set up camp so quickly that there was still a lot of time to just chill. Later that afternoon we watched animals from the hide overlooking the waterhole below us. Back at our campsite, there was a braai-place, but we chose to cook our food on the little gas stove on the inside of our camper’s door. The fire was made simply for the sake of it. After all, what is a camp without the crackling of flames? We sat around the table, chatting and slicing veggies for our salad. The evening stretched ahead of us and it was almost too easy to feel at home. And so we sat and watched the sunset from our perch at Etosha’s Olifantsrus campsite, reminiscing about camping trips prior to this one… How much easier life had just become. Don’t forget to buy these necessities before heading into the wilderness! Cleaning supplies for dishwashing etc. This article first appeared in the Spring 2017 edition of TNN.